PROMOTioN has added two new, industrially relevant demonstrator work packages concerning HVDC gas insulated switchgear technology and power hardware in the loop simulation of meshed DC grids and converter harmonic behaviour. Two new work packages have been added that address two core elements of meshed HVDC offshore networks: the first enables the formation of reconfigurable nodes in the network, and the second provides the ability to guarantee stability in operation of the HVDC network. The first Work Package (WP), WP15) contains five concrete steps which will progress the development of HVDC gas insulated switchgear (GIS), a technology with a clear cost saving potential for the realization of offshore HVDC networks, taking it to a level where it is qualified and ready for commercial operation. The second Work Package (WP16) addresses the operability and control of an HVDC meshed network and investigates harmonic performance of wind turbine generator inverters. Both new work packages have a high and industrially relevant demonstration value, and both demonstratably concern key technologies required for the realization and cost reduction of meshed offshore HVDC networks. As such, the proposals are specifically aimed at contributing towards PROMOTioN’s objective to demonstrate different cost-effective key technologies for meshed HVDC offshore networks and to increase their technological readiness level by investigating and overcoming early adopter issues and pitfalls. Compact HVDC gas insulated switchgear is a novel technology that has the potential to deliver substantial cost reductions in offshore HVDC installations. In a new WP15, PROMOTioN will demonstrate the technical maturity of this technology by means of a long-term test of a 320 kV ABB HVDC GIS prototype in DNV GL’s KEMA Laboratories. Moreover, extensive analysis of the behaviour of different types defects will be used to develop monitoring and diagnostic techniques for HVDC GIS, and the performance of alternative insulating gases will be studied. Combined with the HVDC circuit breaker work stream, the addition of the HVDC GIS demonstrator will make PROMOTioN the first to demonstrate all primary equipment required to realize an HVDC hub, a key element of meshed HVDC networks. Electrical power systems consist of reconfigurable connections between nodes. The reconfiguration is necessary to achieve reliability and is achieved by means of switchyards. A switchyard is located at nodes within a network, and contains so called switchgear i.e. switches which are distinguished by the amount of current they can interrupt. In case of switches that can interrupt fault currents, they are called circuit breakers, which are already a core part of PROMOTioN. Another essential type of switch is a disconnector, which needs to (re)configure a certain network topology. Furthermore, the switchyard typically contains earthing switches, measuring and overvoltage mitigation equipment. Currently, all these components are implemented as air insulated systems in contemporary HVDC installations. This air insulation requires large clearance distances to the equipment’s enclosures, and requires conditioning of the air surrounding the equipment. 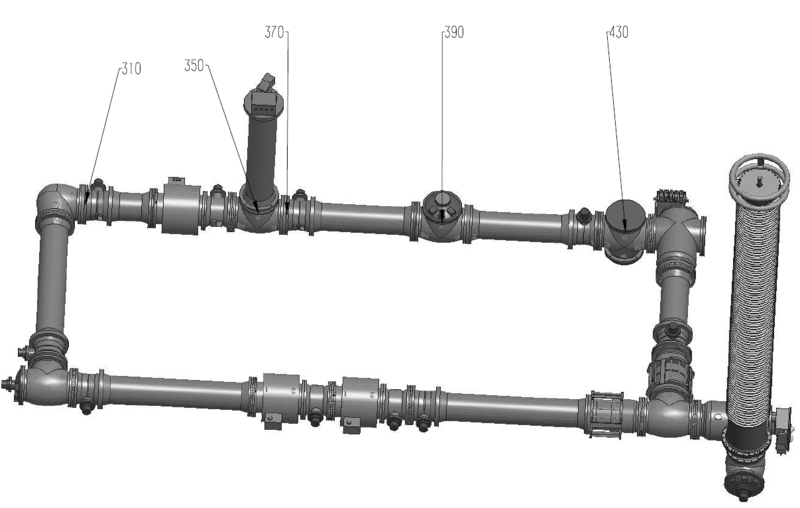 Both requirements are hard and expensive to implement offshore where every cubic meter comes at a premium. Guideline for specification – As HVDC GIS has not yet been applied, yet has different characteristics from the well-known AC GIS, the lack of experience and understanding is seen as a hurdle to uptake. WP15 addresses this issue by producing guidelines that will be used by TSOs or other future users of HVDC GIS regarding how to correctly and completely specify HVDC GIS for their application. Testing procedures & methods – A sign of technological maturity is the availability of standardized testing requirements, procedures and methods. Standardization initiatives are already underway for DC GIS in CIGRE and IEC, but have not yet been published. PROMOTioN will progress these existing initiatives to completion and contribute with the combined knowledge of the partners in the consortium. Monitoring & diagnostic methods – Especially offshore, reliability is a key requirement. Part of that is a publicly available understanding about the characteristics of defects and degradation in HVDC GIS and how they can be detected. To this end, PROMOTioN will study the behaviour of a range of defects in a test set-up and build equipment with which it can be detected and characterized in order to be able to assess the condition of HVDC GIS. Viability of alternative environmentally friendly gases – The insulating gas that is currently used, SF6, is a strong greenhouse gas and toxic after electrical activity. Several more benign alternative gases have been developed by industry for AC, one of which will be studied for DC application in detail so as to better understand characteristics of defects and degradation and the differences with SF6. The developed monitoring and diagnostic tools will be used for this characterization. Demonstration of HVDC GIS – Although HVDC GIS has been tested in the manufacturers’ labs or associated labs, the long term performance based on standardized testing techniques including monitoring equipment has not yet been carried out at an independent lab. PROMOTioN will carry out such a long duration test with elevated electrical and thermal stress levels on a full scale HVDC GIS pole from ABB at DNV GL’s KEMA laboratories. By doing so, effectively the testing of all equipment required for an HVDC switchyard, i.e. also including an HVDC circuit breaker, will be demonstrated as part of PROMOTioN. The Work Package partners consist of a manufacturer (ABB), a research institute (SGI), a university (Delft University of Technology), two TSOs (TenneT & SHE Transmission), and an independent consultant/test lab (DNV GL). The range of stakeholders assures a comprehensive approach and direct uptake of the results and confidence in technology into operational levels. The possibilities for a field demonstration of HVDC GIS were explored. However the steps taken in WP15 progresses, the technology readiness level of HVDC GIS, not just as a component, but as a technology with all the associated supporting documentation and technologies such as standardization, testing, monitoring, diagnostics, etc. to a level ready for commercial uptake. All these factors developed to a sufficiently high level of readiness are necessary for real world implementation, something that would not be achieved with a field demonstrator alone. As such, the proposed desktop studies and standardization work, academic laboratory investigations, and full scale industrial test lab qualification combined provide a compelling argument of the readiness of HVDC GIS technology and an increase in TRL which is comparable to what could be achieved with a field demonstrator. It is also important to note that not only will the DC GIS demonstrator raise the TRL of the technology itself, but in turn also provide a step further for optimization of deployment of DC technology offshore, due to the reasons explained above. Technology interoperability and controllability of different types of converters in meshed VDC networks is studied in detail in WP2. In the new WP16, the feasibility of these concepts will be demonstrated in a power-hardware-in-the-loop (PHIL) modular multilevel converter (MMC) test bench at RWTH Aachen. The test bench will consist of a hardware meshed DC grid fed by hardware MMCs. The MMCs are connected to hardware power amplifiers that will be programmed to emulate different European synchronous zones. The DC network will be equipped with the hardware protection system developed in WP4. Moreover, a small-scale diode rectifier unit will be included to demonstrate its grid integration. Lastly, in a separate set-up at DNV GL KEMA Laboratories, wind turbine generator inverter harmonic performance models will be validated by means of a 1 MW PHIL demonstration. As such, the new demonstrator covers operational aspects of all elements of a meshed offshore HVDC network. In a new Work Package, WP16, RWTH Aachen will realize a flexible adaptable converter test bench that can demonstrate interoperability and controllability of meshed HVDC grid technology on all technology levels (not only for DRU converter but also for multilevel half bridge and full bridge converter (MMC-HB, MMC-FB) control. The demonstrator is a highly versatile MMC test bench. It’s able to demonstrate the behaviour of converters and control schemes in particular, but also to vastly improve the simulation capacity regarding potentially crucial interactions between the HVAC onshore and the meshed offshore HVDC network, e.g. regarding control induced resonance phenomena. The Technology Readiness Level (TRL) of the entire “MMC Test Bench” is estimated ranging from 6 to 7 within PROMOTioN’s project context. The individual components of the setup are available as commercial products with a certain degree of customer experience (TRL 8 to 9). Therefore, all investigations with WP 16 can be performed on an established system within its operational environment. The control and protection systems that will be developed within the project context of PROMOTioN reach a prototype readiness level. With the testing and proving out of these prototype systems within an operational environment, an overall TRL of 6 will be achieved. With the progress of the project and the continuing process of work on these prototype systems, even the TRL 7 is possible. The involved partners in WP 16 are four universities (KTH, RWTH, UPV and DTU), an independent consultant (DNV GL) and a wind farm developer (Ørsted). The respective partners within WP 16 intend to broaden the scope of PROMOTioN with respect to currently important research issues in order to clarify the system and gain confidence within the planned meshed offshore networks. RWTH will lead the installation and commissioning of the MMC test bench and intends to demonstrate the interoperability and controllability of a meshed offshore network. The investigated cases are determined in collaboration with WP 2 and WP 3. 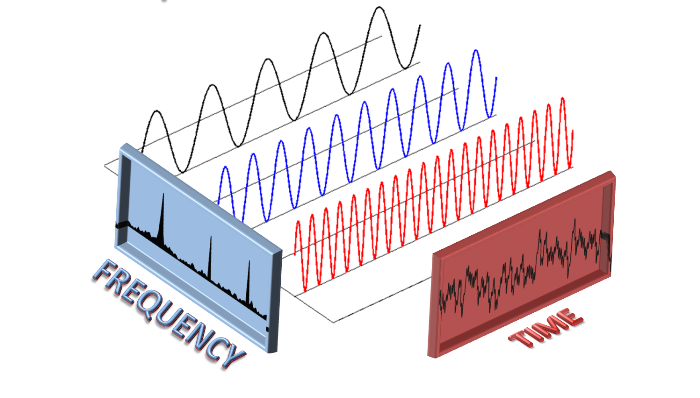 WP 16 also includes the task of investigating harmonic resonance phenomena. Within several discussions, WP 2 and 3 derived the need for these investigations. In this task, all WP 16 partners are involved (RWTH, DTU, DNV GL, KTH, DONG Energy/Ørsted, UPV). DNV GL develops and implements a new approach for the harmonic resonance modeling and prepares the additional capacity for real time validation by means of a 1 MW full wind turbine generator converter. This is an important step for early stage de-risking of HVDC technology and wind power and consequent cost reduction. DTU analyses the interaction of the DC network with the offshore wind parks used in WP 3. The investigated cases are determined in collaboration with WP 3. KTH includes developed protection methods derived from WP 4 and analyses the interaction between control and protection. UPV investigates the behaviour of DRU in the hardware offshore network. Ørsted consults the investigations in WP 16 to bring in a developer’s view. As explained above, the main challenge in DRU deployment is related to wind turbine control. WP16 will address this issue based on the work of WP3 and it will do so in a possibly more comprehensive way, as concepts from WP2 involving MMC technology will also be tested. 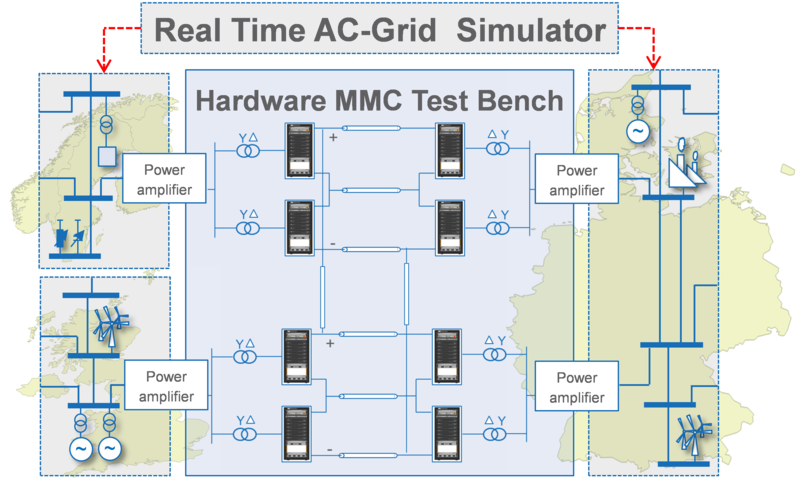 Therefore the MMC test bench demonstrator also supports the work of multiple work packages within PROMOTioN when it comes to verification of developed simulation models.